Dimensions 0.26 by 6 by 9 in. 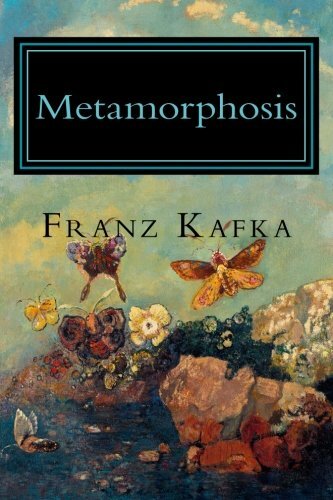 Amazon.com description: Product Description: Metamorphosis is a novella by Franz Kafka, first published in 1915. It has been cited as one of the seminal works of fiction of the 20th century. The story begins with a traveling salesman, Gregor Samsa, waking to find himself transformed into a large, monstrous insect-like creature. Samsa must learn to deal with his hideous new condition. One day, Gregor Samsa, a traveling salesman, wakes up to find himself transformed into a giant insect (the most common translation of the German description ungeheures Ungeziefer, literally "monstrous vermin"). He reflects on how dreary life as a traveling salesman is. As he looks at the wall clock, he notices that he has overslept and missed his train for work. He ponders the consequences of this delay. Gregor becomes annoyed at how his boss never accepts excuses or explanations from any of his employees no matter how hard-working they are, displaying an apparent lack of trusting abilities. Gregor's mother knocks on the door, and he answers her. She is concerned for Gregor because he is late for work, which is unorthodox for him. Gregor answers his mother and realizes that his voice has changed, but his answer is short, so his mother does not notice. His sister, Grete, to whom he is very close, then whispers through the door and begs him to open it. He tries to get out of bed but is incapable of moving his body. While trying to move, he finds that his office manager, the chief clerk, has shown up to check on him. He finally rocks his body to the floor and calls out that he will open the door shortly. Offended by Gregor's delayed response in opening the door, the clerk warns him of the consequences of missing work. He adds that Gregor's recent performance has been unsatisfactory. Gregor disagrees and tells him that he will open the door shortly. Nobody on the other side of the door has understood a single word he had uttered as Gregor's voice has also transformed, and they conclude that he is seriously ill. Finally, Gregor manages to unlock and open the door with his mouth. He apologizes to the office manager for the delay. Horrified by Gregor's appearance, his mother faints, and the manager bolts out of the apartment. Gregor tries to catch up with him, but his father drives him back into the bedroom with a cane and a rolled newspaper. Gregor Samsa injures himself squeezing back through the doorway, and his father slams the door shut. Gregor, exhausted, falls asleep. Gregor awakens and sees that someone has put milk and bread in his room. Initially excited, he quickly discovers that he has no taste for milk, once one of his favorites. He settles himself under a couch. The next morning, his sister comes in, sees that he has not touched the milk, and replaces it with rotting food scraps, which Gregor happily eats. This begins a routine in which his sister feeds him and cleans up while he hides under the couch, afraid that his appearance will frighten her. Gregor Samsa spends his time listening through the wall to his family members talking. They often discuss the difficult financial situation they find themselves in now that Gregor can't provide them any help. Gregor had plans of sending Grete to the conservatory to pursue violin lessons, something everyone else â including Grete â considered a dream. His inability to provide for his family, coupled with his speechlessness, reduces his thought process greatly. Gregor Samsa also learns that his mother wants to visit him, but his sister and father will not let her.